The cost of spray foam insulation is intimidating to the average homeowner in Colorado, and deservedly so. A lot of people overlook and dismiss the option of spray foam insulation, not knowing all of the facts about this fantastic product and the benefits it can have for your home or business. Like it or not, spray foam insulation outperforms all other types of insulation by outstanding margins and will pay for itself over its lifetime. Well, it derives from two types of composite materials (polyurethane and isocyanate) which when combined, chemically react causing a foamy substance to expand and eventually harden. During installation, the products are simultaneously sprayed out of a gun to the desired area. As it is sprayed, the materials expand and fill the desired gaps and crevices they are applied to. Spray foam insulation comes in two different types. One is called open cell spray foam, and the other is closed cell spray foam (the spray foam we endorse and use). While more expensive than open cell spray foam, closed cell spray foam has an amazing list of qualities which we will outline below. Is Spray Foam Insulation More Energy Efficient? Closed cell spray foam insulation works much better as an efficient year-round insulator than more traditional types of insulation on the market today. Spray foam insulation guarantees an airtight seal in all cracks and spaces within your home or business that would otherwise be left unfilled by cellulose batts insulation. Closed cell spray foam insulation’s number one claim to fame is its R-value (Resistance-value). In other words, it’s known for its ability to provide an airtight seal at a value of R-6, which happens to be the highest value on the market today. Spray foam has made a name for itself due to it powerful energy saving properties. Families and businesses who have transitioned to spray foam insulation have been able to save tremendous amounts of money on their energy bills on a yearly basis. A feature that helps spray foam insulation over traditional insulation is the fact that it is 24x less permeable to air infiltration than traditional forms of insulation. Because of this, families and businesses all around the state of Colorado have saved hundreds to thousands of dollars each year on their energy bills. In fact, spray foam insulation has been shown to save people an average of 50% or more per year on their energy bills. Unfortunately, the presence of holes and cracks in your walls can allow more than just air to sneak into your home. Moisture can also make its way into your home through small cracks and crevices if they are not adequately sealed and protected with proper insulation or filler. Spray foam insulation acts as an effective filler and insulation. It fills and insulates small cracks and crevices throughout your home or business. Because it is impermeable to water, spray foam insulation will remain intact if flooding or moisture were ever to impact your home. Is Spray Foam Resistant to Mold? Spray foam insulation is water resistant which helps deter any mold growth, but it also is composed of an inert polymer that provides no source of food for bacteria and mold to live off of. Homes and businesses that have closed cell spray foam insulation within them aren’t subjecting themselves to harmful mold and bacteria growth. This will prevent bad smells, health risks, while also reinforcing the overall stability of your home’s or business’ structure. Does Spray Foam Last Longer than Traditional Insulation? Closed cell spray foam insulation has an indefinite lifespan. This allows homes and businesses to reap the benefits of their spray foam insulation for years on end before needing to replace it. Investing in spray foam can save families and businesses money over the course of a 20-year period because of its ability to stay performing at an optimal level for the entirety of its lifespan. 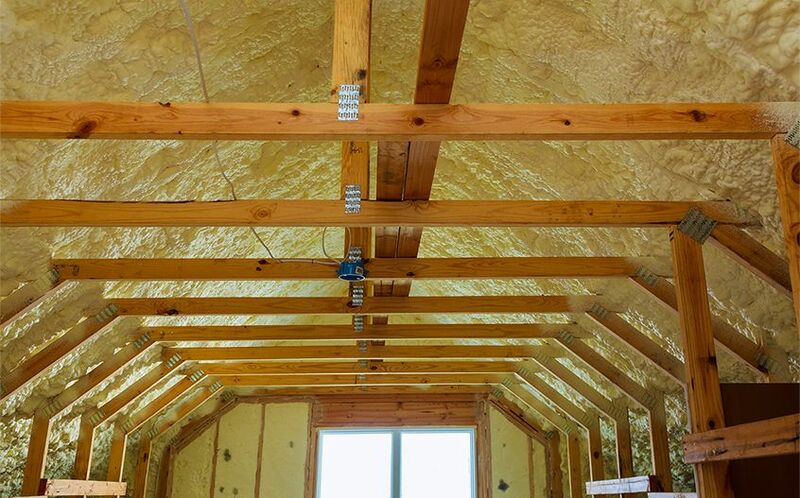 One of the questions we hear the most about spray foam insulation is if it is eco-friendly. The answer to this question is always, “YES!” Spray foam insulation has a ripple effect regarding protection of the environment. It helps reduce the energy consumption of a space creating a “green” effect. It also produces fewer consumable materials because it is built to last. Long lasting insulation will reduce your carbon footprint dramatically over the lifetime of the insulation. Closed-cell spray foam insulation is one of the best insulation types available. Whether you are planning to use it for your attic, crawlspace, or basement walls, it will certainly be effective in every way. At REenergizeCO, we are committed to providing quality insulation services across Denver, and the entire front range of Colorado. We use only the highest quality materials and hire ZERO third-party contractors. Whether you choose us for your next insulation job or not, we hope this guide to spray foam insulation has been useful and that you will eventually opt to switch to this phenomenal product. Contact us with questions today!